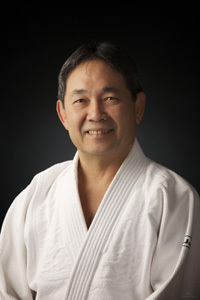 Paul Sunn’s practice started in 1970 at the JCCC and has been continuous until the present. His preferred style of practice is using circular movements, “going with the flow” without utilizing one’s physical strength. He believes this type of practice should include good balance, allowing free and easy movement with power coming from a quiet centre using “kokyu” to release energy. He also feels learning how to quiet ourselves inside is very important to practice, allowing calm throughout and that Aikido should be practiced 24 hours a day in and out of the Dojo by being always aware of your centre.